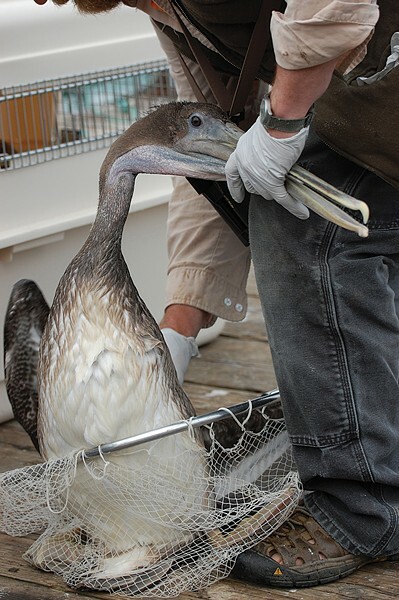 Monte Merrick rescuing an oiled pelican from the Trinidad Pier in 2012. It co-stars some local creatures, including wildlife rescuer Monte Merrick, of Bird Ally X and the Humboldt Wildlife Care Center; some oil-bedraggled pelicans who’d foraged in openly dumped fish offal in some of our fishing ports; and a pelican rescued from a McKinleyville parking lot. The film, making the rounds around the country, shows through Thursday, Dec. 11, at the Minor. Some Journal stories about brown pelican rescues: Déjà Rescue. Bird by Bird.